Alright, let’s do this, oh god.. This is gonna be like 10 posts in one, Allah y3eenkom LOL! 5. I wear glasses, yep!! That’s right, I used to be obsessed of contacts, I hates the glasses, but for few months now, I became lazy and I just wear my glasses. 6. I got lost once in Amman, and ended up in the royal palace (I still don’t know how I ended up there)!! 9. I hate history, I used to cause sooooooooooooo many troubles in history class, and I got kicked out of it several time, bad bad bad Maioush! 10. if someone gets on my nerves, I can be very rude, I smile a lot and all, bs ma y’3orkom el mazhar 🙂 .. when I’m mean.. I’m mean!! For real, I always’ end up hurting people’s feelings! Hehehehe Mai. 7atta bilsayyarah btor2osy??? u never told me if it worked with u??? lol I do 4 & 5 too… walek history? I cut half the classes and passed with an A, how? ma ba3ref wallahi. Whats with the gray hair inty wo wa3d?! LOOOOOOOOOOL, you didn’t change the way the tag should be I noticed 😀 na2shat ma3ek LOL! Waleh!!!!!!!!!!!! I eat more than my brothers, 7aram 3aleaki 😦 !! walek if I do kan sar wazni 1000 :S , yabaye el taballiiiiiiiiiiiii!! I think I am worse than Monica as well. Way worse … It gets on my sister’s nerves. 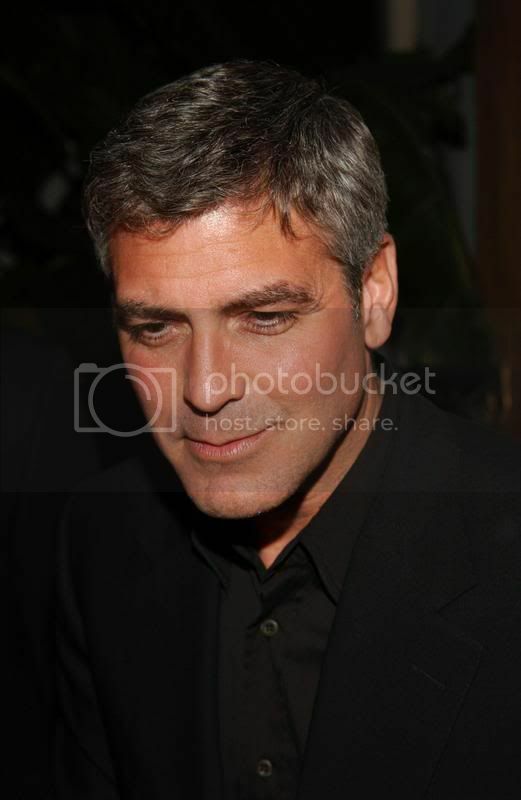 I LOVE George Clooney, he is so handsome. I dance in the car as long as the music is cool. George Clooney is not handsome!!!!! eh! say what??? elli ma betool el 3anab…..! LOOOOOOOOOOOOOOOOOOOL! la2 3amel 6aylo o akalto kaman! bas feee kteeer actors a7la meno! amma Clooney! no thank you! !